This was run in the normal direction. With the bypass, making turn 5 a high-speed very off-camber segment with no visibility till you are over the hill. Very tricky. A very fine track day, very pleasant all day. The GGLC track day was run clockwise (the opposite of the normal direction). This makes Thunderhill a completely new track so everything you thought you new is irrelevant, and for left-hand-drive cars puts you the driver on the outside of most turns! It was not windy, but was 97 degrees in the shade by afternoon. I had the Europa corner-weight-balanced and aligned at DietschWerks (.com) before the event so handling felt very consistent in left and right turns. It was a perfect day at Thunderhill. Warm but not hot and not windy. 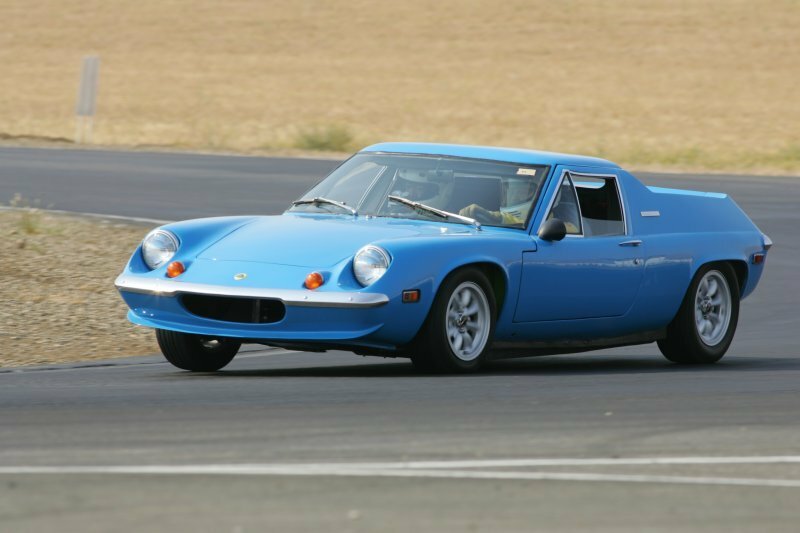 The car ran well though I was a bit dismayed when Scott Hogben in his TwinCam Europa out-accelerated me on the straight. When I got home I finally discovered the throttle cable had slipped and I was getting just 83percent of full throttle (oops). The picture is of Team Europa with turn 1 in the background. The leftmost and rightmost cars are Zetec 2.0Liter power, the red/yellow Flamer is Duratec powered, and the black JPS is a weber head TwinCam. It was a perfect day at Laguna Seca. The car ran well until the connection from the alternator to the battery broke after lunch. The battery alone probably would not run the car even one lap. The terminal to the alternator output post was not as well made as it should have been (my fault) and I failed to bring along spares to fix it properly, so I called it a day. My best lap was 1:53.0 but I am sure the car can do better (whether I can is always a question :-). For the first time I began to do corner 5 properly, and I never got close to doing corner 6 right today. New Toyo Proxes r888 tires (shaved) were on their first outing and seemed fine (1G in turn 3, 1.2g in turn4 in my best lap). 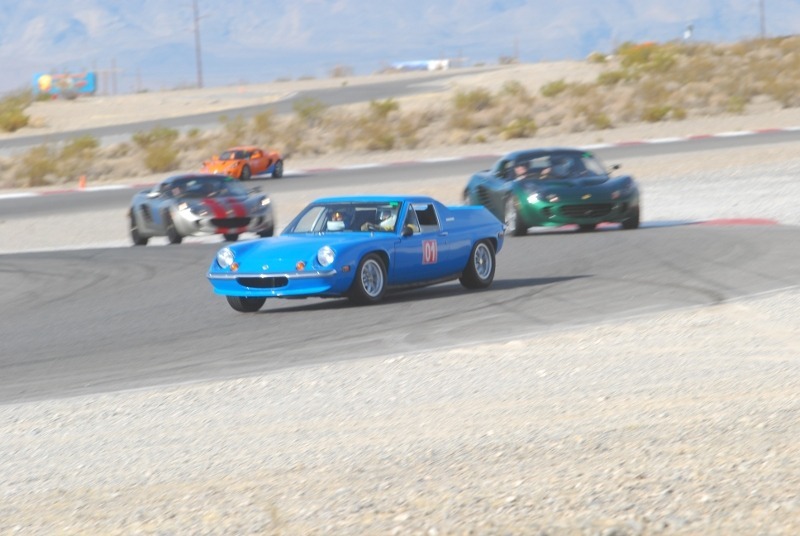 Spring Mountain Motorsports Ranch, Pahrump, Nevada. 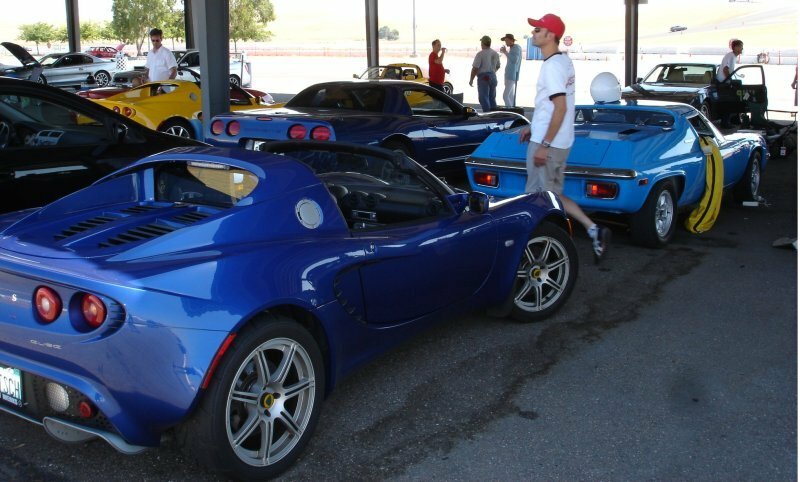 The 2009 West Coast Lotus Meet. This picture was from the first session (so I was just beginning to learn the layout), and Jeff Wenger was in the passenger seat as mandatory instructor. (After that session he signed me off so I ran on my own from then on). The track is 60 miles from Las Vegas and is a lot of fun. It is many loops and turns which can be configured as many different layouts. For the WCLM it was 2.2 miles and 10 turns. A local driver told me that running the entire track is really hard, there are so many turns it is really really hard to learn. Pictures of the track (and even Google Earth) really do not do it justice. There are subtleties in the two esses areas of off camber exits and as usual I braked too early and slowed too much at the end of the two long straights. They were very firm about 'no passing except on the two straights' for the track day. Which meant one could ignore one's mirrors except at the beginning of each straight. Interesting concept. The Europa ran very well. If you get a chance, by all means try this track. You will like it. Everyone does. Thunderhill Raceway Park, Willows, California. GGLC Track day. Like the 2008 September track day this was cool in the morning and warmed up to 97 degrees F by late afternoon. We ran the track clockwise (backwards) and with the bypass so no driving over the cyclone. This was the first day the Europa has really been ready to run with no Zetec engine issues or other issues to deal with. Water temp was 95 degrees C and oil temp was 250 degrees F at worst. I also got the DriftBox track logging device installed properly (it is on the dash in the picture) so I have complete personal logs of every lap on track on an SD card. I really need to work on my high-speed corners, I don't think I was doing any of those very well and that costs a lot of time. A preliminary look at the data reveals a couple things: my maximum speed of 117mph on the straight was indicative that more speed is available (I'll be at maximum rpm somewhere around 125 mph) and the maximum sustained G force of a bit over 1G suggests the tires (Toyo Proxes RA1) and suspension are working ok.
Thunderhill Raceway Park, Willows, California. GGLC Track day. It was 88 degrees F in the early morning and 106 degrees F by 3PM. The Europa's second track outing since the Zetec finished. MCE Racing (at Thunderhill) dyno'd the car and helped me get the mixture strength right (adjustments are easy, the engine control is via Megasquirt ECU -- computerised engine control adjustable with a laptop). 169 Horsepower at the rear wheels is not as much as it could be but is adequate for an entertaining drive in a 1500 to 1550 pound car (as driven without my 155 pounds). Thunderhill Raceway Park, Willows, California. GGLC Track day. The Weather was cool in the AM and up into the 90s(F) by afternoon. 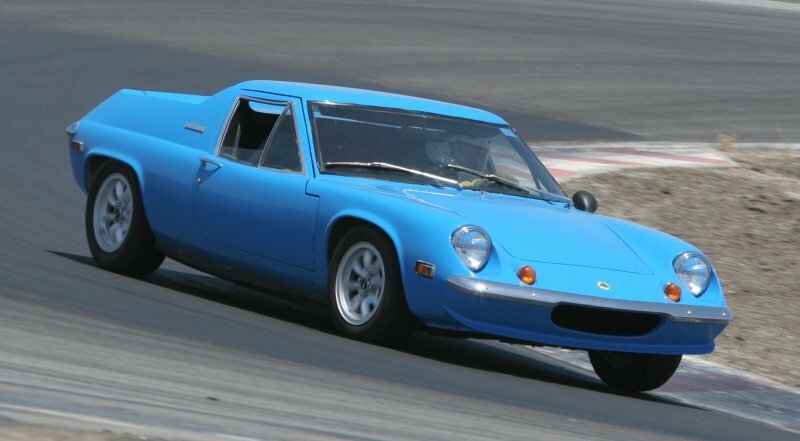 This was the first outing of the Europa with a Zetec 2.0Liter engine so I did few laps and was datalogging the engine when on track. Thunderhill Raceway Park, Willows, California. GGLC Track day. A sunny day, cool in the morning and pretty hot in the afternoon (well over 90 degrees F). 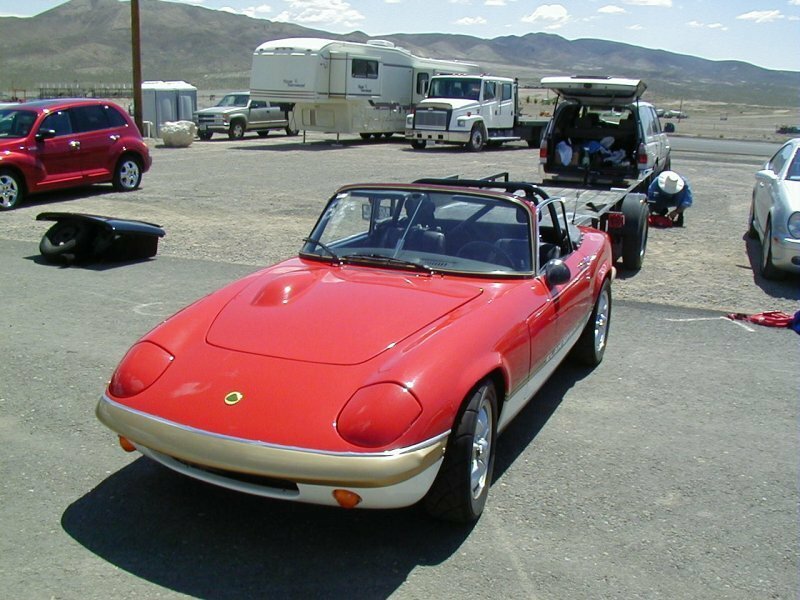 The Europa is still not ready, so the Elan was pressed into service. 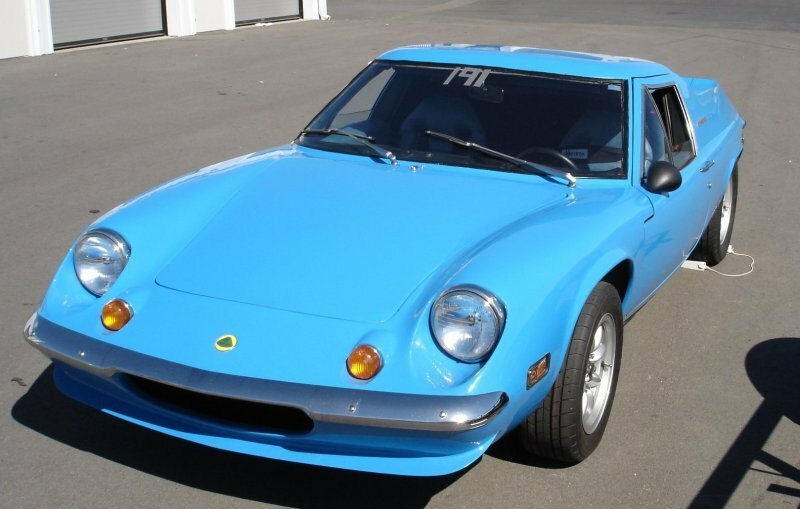 We ran 'backwards' (clockwise) so most turns were right-hand (not the best for a stock Lotus Twin Cam oil pickup, so I was a bit cautious in long turns). This picture is of Turn 14. 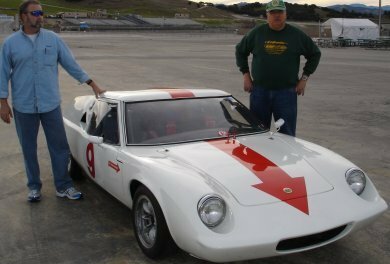 MCE Racing opened a chassis dyno at Thunderhill, so I had Kevin Murray (proprietor) dyno the Elan (pretty much stock, late CPL2 cams). 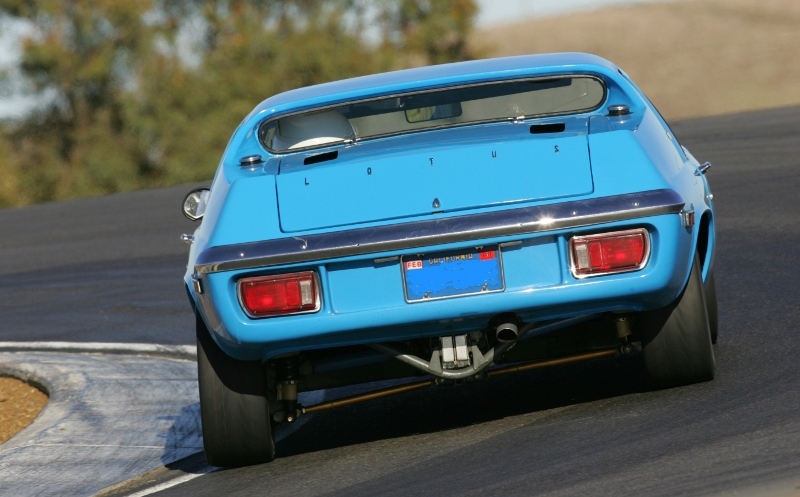 Before Stromberg adjustments it showed as 107 HP, and after showed as 111 HP at the rear wheels. Torque improved throughout the range, and by 3 ft/lb at all higher rpm. Richening the mixture also made the engine significantly cooler at 6000 rpm (as experienced on track). Well worth the cost of the dyno time. Mazda Laguna Seca Raceway, Monterey, California. A perfect day at the track. Cool and dry and sunny. 75 cars. Seven 20 minute sessions each. A total of 107 miles on track. New rear-shock-top spring mounts limited spring compression just enough to prevent the axles contacting the frame. Left rear lamp holder assembly came off, but the electric wires held it on long enough to get into the paddock and replace the screws and avoid damaging anything (the assembly is no longer readily available!). The Europa ran well. On track photo copyright Carlos Oliveras. 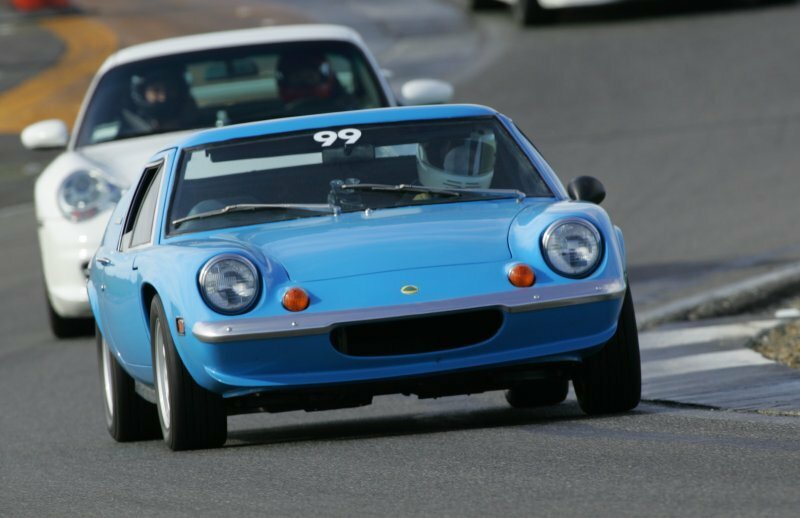 Team Europa is at every GGLC track day, and this one is no exception. 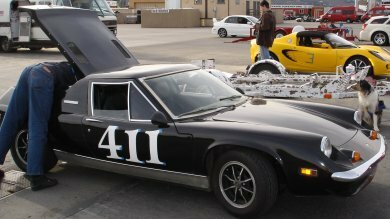 The black Europa is Scott Hogben's car. The "Flamer" is John Zender's car (powered by 2.3 Liter Duratec Ford). And two other Europas entered (Jerry Rude and the Series 1 of Evil Twins Racing (Farber/Wardman)) gives a total of five Europas: a good showing. Photo by David Anderson. Thunderhill Raceway, Willows, California. It was a very hot day at Thunderhill. My old tire temp guage said the air temp was 101 in the afternoon. It was over 80 early in the morning! 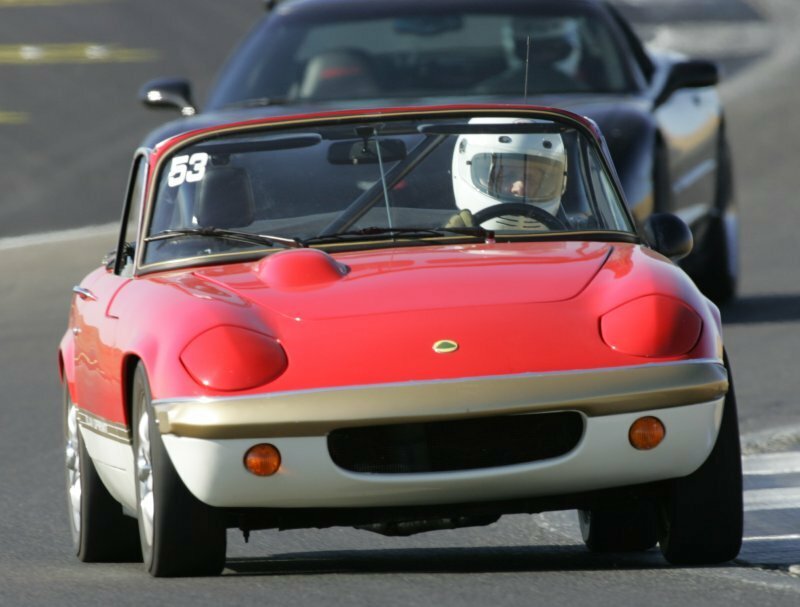 The track day was fully subscribed at 65 entrants. We ran the track "backwards" which made it very challenging indeed. The usual blind corners were even harder in reverse! This covered area Thunderhill built is a big help on a hot day. Here just showing a few of the cars under cover. The trailer is a simple Carson utility trailer built for me in 2005 and modified so I can open the europa driver's door (not shown) with the Europa moved forward. And modified to hold the ramps. Trailer is about 900 pounds. Car with me and 1/2 fuel is about 1600 pounds. Button Willow raceway, Button Willow, CA. 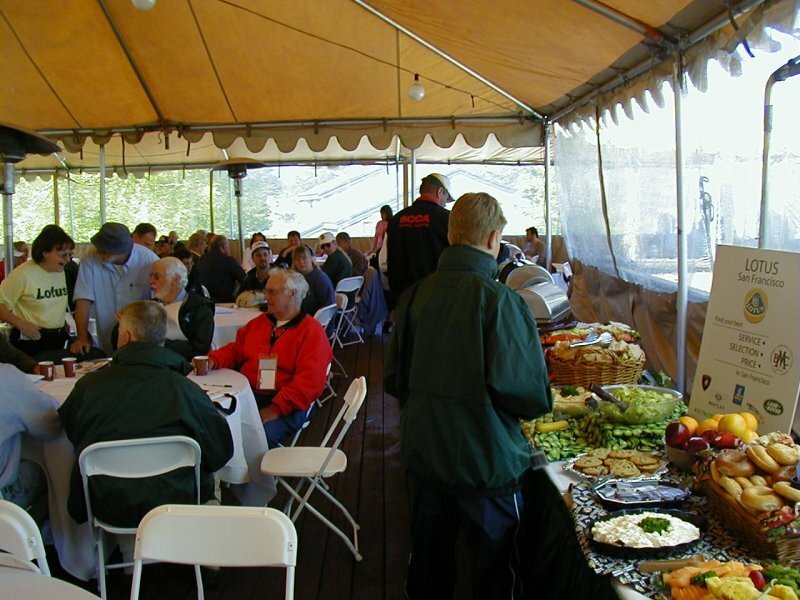 This is the first day's event of the 2006 WCLM (most of which was at Morro Bay, CA). Air temperature was 85 degrees F in the morning and 101 degrees in the afternoon (paddock pavement 20 degrees above those numbers). The Europa cooling worked well, the car ran at normal temperatures on track. The berms at BW are higher than in the past, best to stay off of them entirely! Four Europas at this event. This picture is the hairpin 180 degree turn, south-east corner of the track. Using the 'original' version of the corner (the later one is just a few feet longer, off 50 feet to the left as you look at this picture). Picture copyright Carlos Oliveros, www.extpictures.com. The second day (Friday) of the WCLM was a wine tour to Eberle Winery. More than 20 Elise and 2 Europas were among the folks who enjoyed some fine tasting and a nice lunch and tour of the caves. 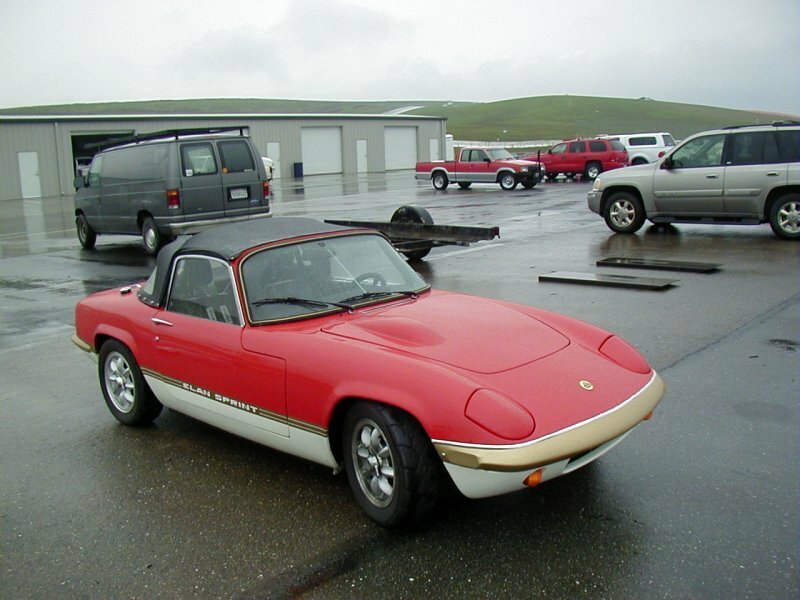 The first GGLC track day of 2006 at Mazda Laguna Seca, Monterey, CA. 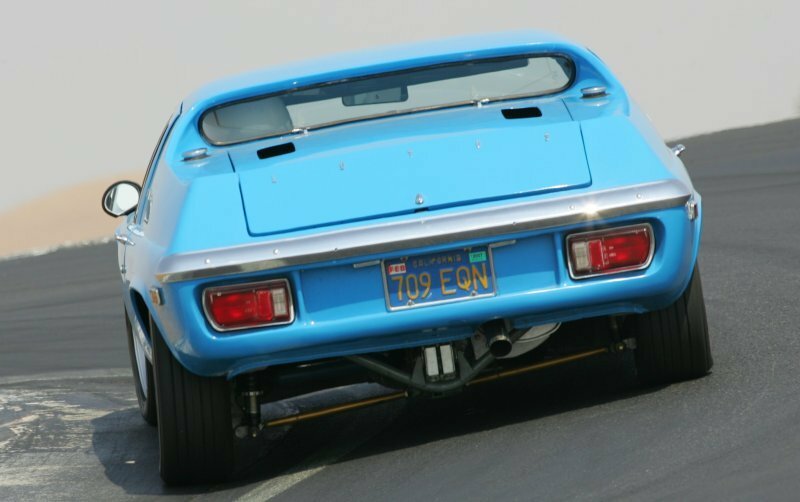 I had adjusted the rear suspension too low so the axles contacted the frame (and the muffler) coming out of the corkscrew and turn 10: the noise was alarming. So only a few laps that day and not trying hard - rather slow. We had a full field of 90 cars in 3 groups - we don't think that worked well, our normal 2 groups works much better. Anyway due to the few laps I have Just this one boring picture in the paddock. Most of the paddock was in use by the Russell School so things were a bit messy in the paddock (though you cannot tell from this picture!). 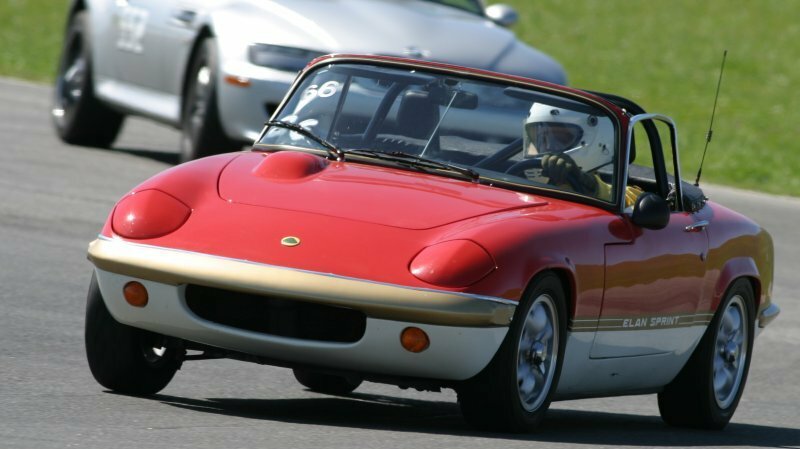 The second 2006 GGLC track day. Thunderhill Raceway Park, Willows California. Raised the rear .7 inches each side (0.4 at home and another 0.3 at the track) and finally managed to avoid the rear axles rubbing on the frame. Wasn't till the last session I finally got really comfortable and was improving by nearly a second a lap per lap. Not quoting times here, you would not be impressed :-). Following image copyright Dito Milian, GotBlueMilk.com. 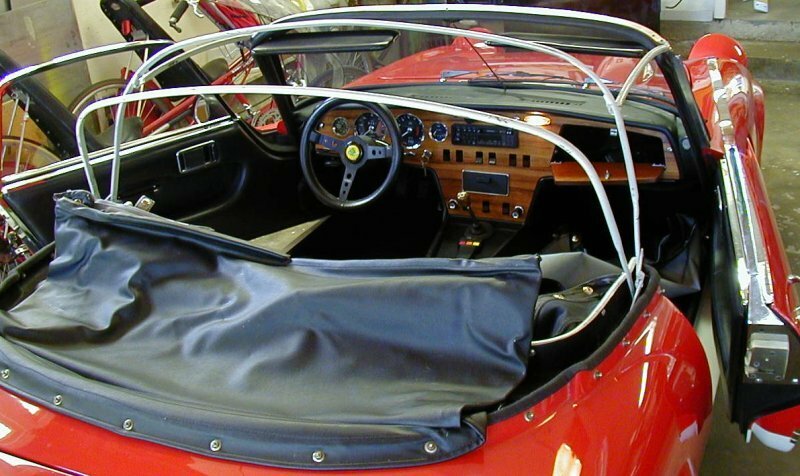 After being 'in restoration' from 1991 to 2005, the 1972 Europa is back on track. Here at Thunderhill July 27. Following image copyright Dito Milian, GotBlueMilk.com. 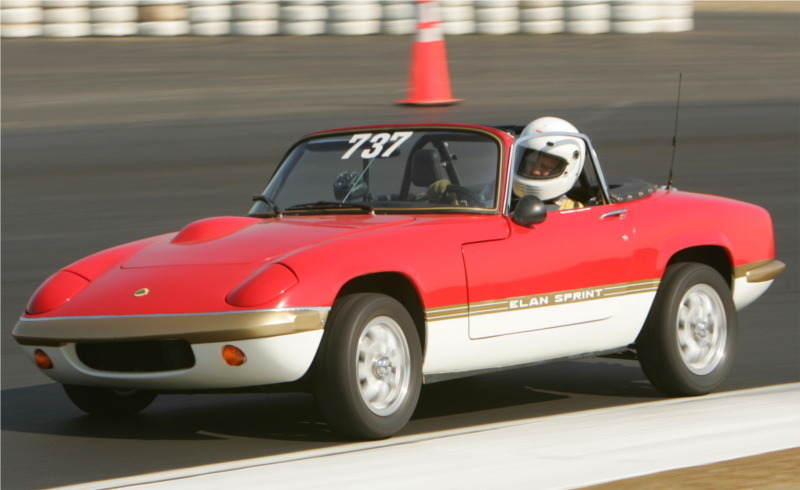 August 27 GGLC (with Sector 111 and the Lockheed Sports Car Club) held a practice Autocross in Seaside California. An opportunity to tune the suspension settings and tire pressures. Here I'm embarrassingly off the fast line. Oops! Sept 10 GGLC (with Sector 111 and the Lockheed Sports Car Club) held a second practice Autocross in Seaside California. An opportunity to further tune the suspension settings and tire pressures. 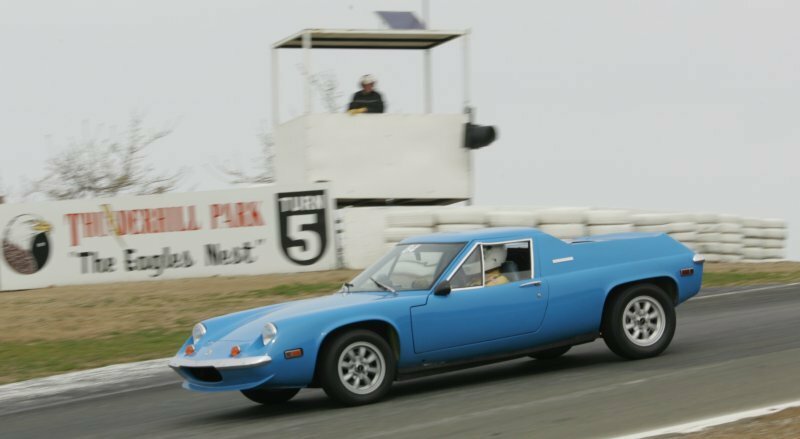 Having seen a small problem with the gearbox rear mount on the Europa, I felt it best to take the Elan to thunderhill while I worked on the Europa. 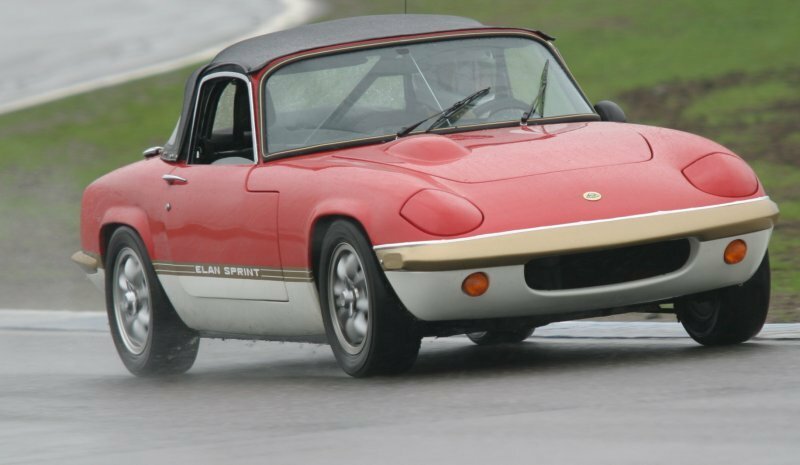 So Sept 13 I trailered the Elan to Thunderhill. The following image is copyright Dito Milian, GotBlueMilk.com. 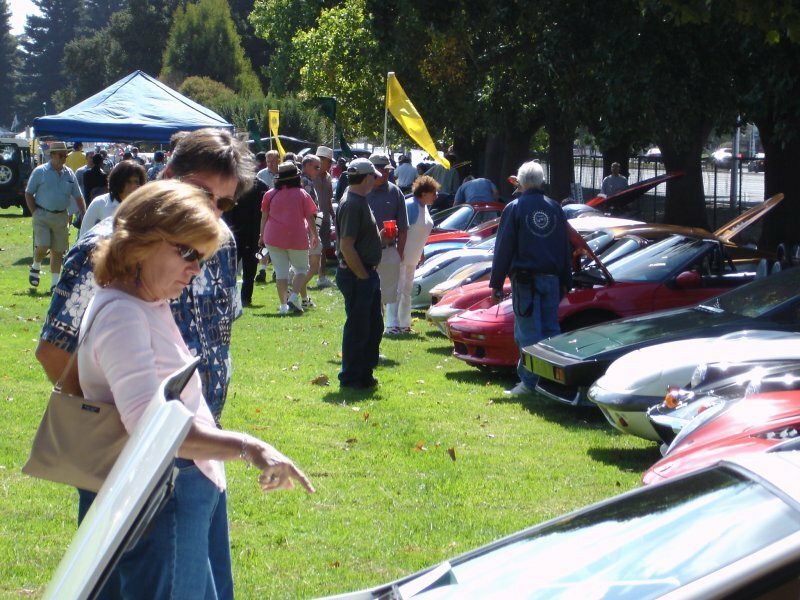 Here's a small slice of the Lotus line at the September 2005 All British Car Meet in Palo Alto. The GGLC had 44 (or so) members cars there, but managed to win the club participation trophy this year... We should have taken both Elan and Europa to the ABCM, but I was too cautious and left the Europa home (the rear gearbox mount is much stronger and more durable than I thought and the Europa was very safely drivable). This Track day at Thunderhill was very wet indeed. Rained all day. February 15, 2004. But we all had a good day in spite of the rain. 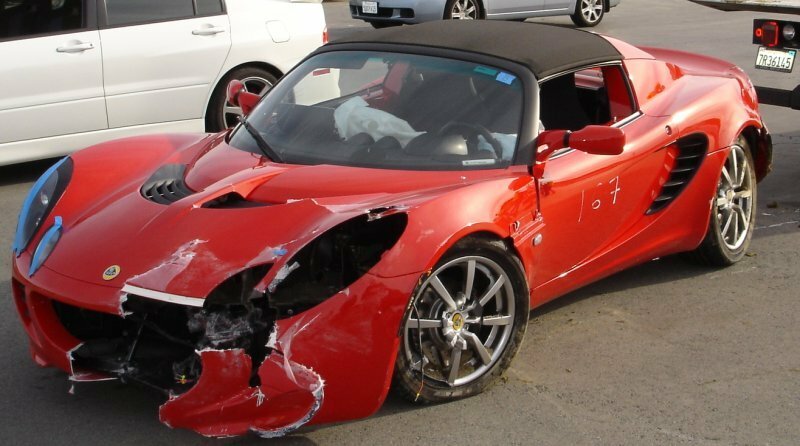 I'd have preferred to run with top-down, but in the rain top up seemed prudent. This was a few weeks before I got my trailer, so I drove from Burlingame to Thunderhill for the event, as I did all previous track days. The following image of me at speed in the rain February 15 is copyright Dito Milian, GotBlueMilk.com. 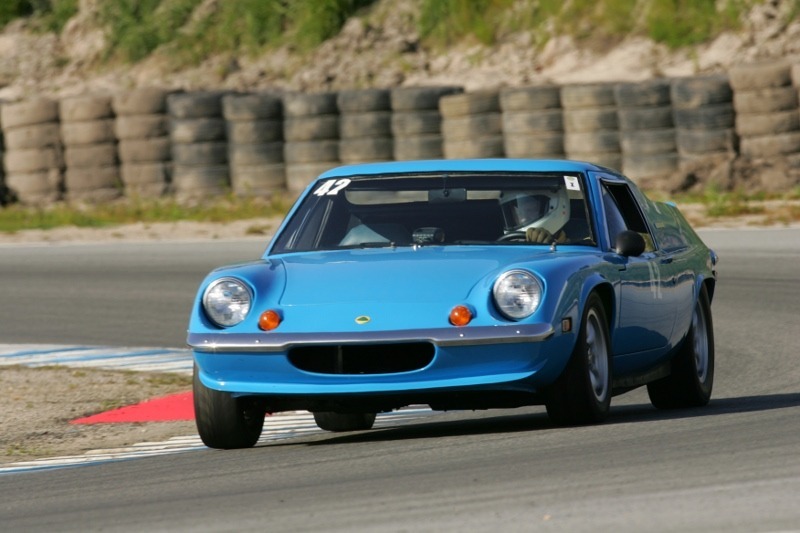 The following image is March 31 at Thunderhill, also copyright Dito Milian, GotBlueMilk.com. 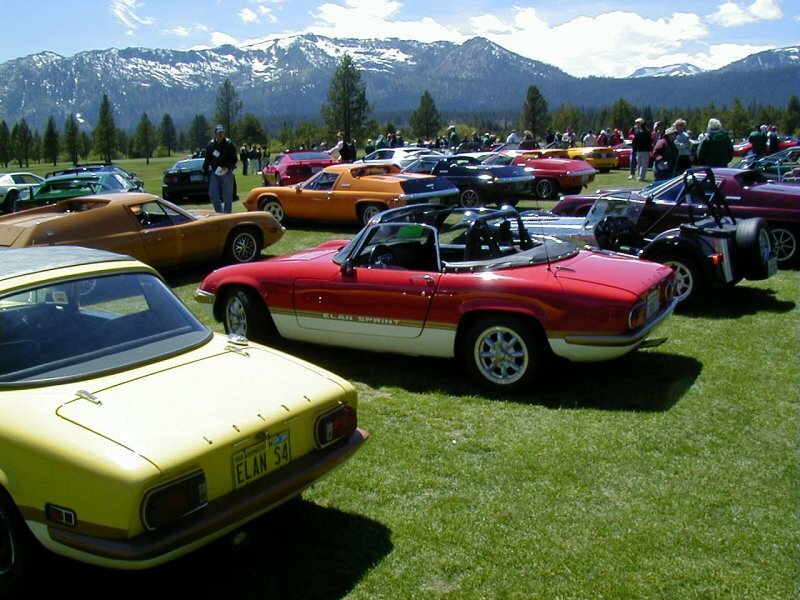 The 2004 West Coast Lotus Meet took place at Lake Tahoe May 20-23. 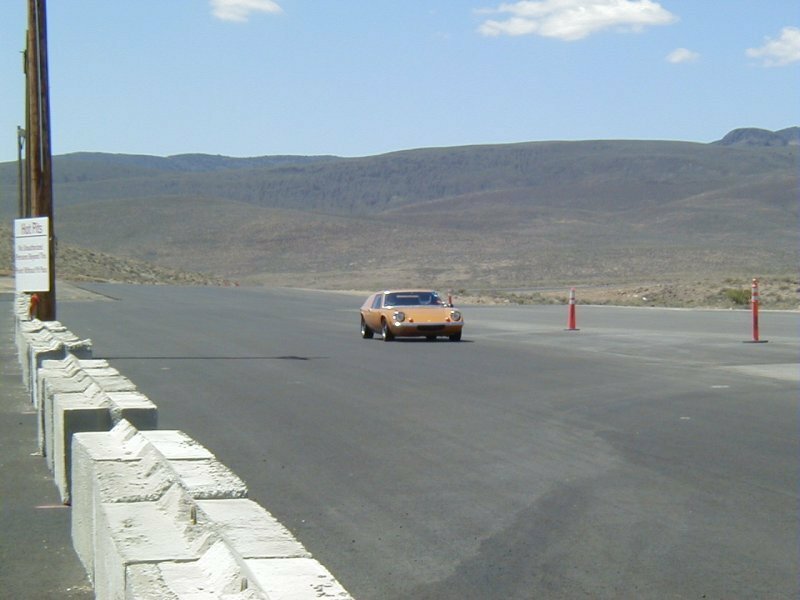 We had a track day at Reno Fernley as well as an autocross at the Lake Tahoe airport. The WCLM dinner was great fun, here are few of the folks present and the buffet table. We were outside under a tent on a beautiful day with a view of Lake Tahoe. 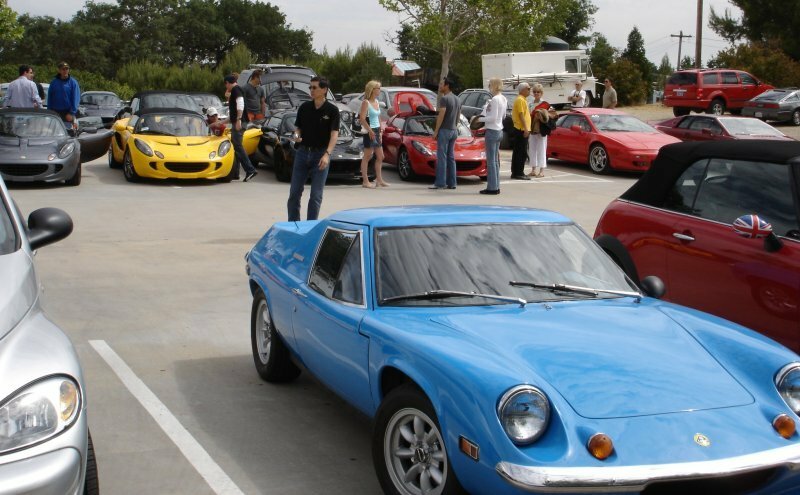 The WCLM concours was as always a casual affair. Folks voted for their favorite cars. This was in a golf course, followed by a very nice picnic barbecue. Notice the delightful background of the Sierras. 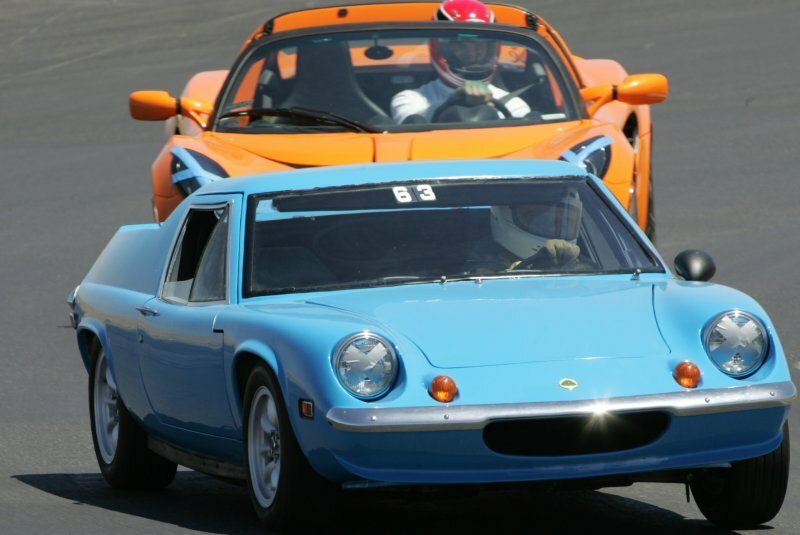 The WCLM track day was at Reno-Fernly Raceway. it's quite near Fernly, Nevada above 6000 feet. It's a fun track and they keep changing it every year, adding new track! Here is a shot of Tom Carney in his 1970 S2 Europa in the pit lane. Reno Fernly is a fun track. This corner was new, and you can just see the lack of any berm on the inside! The following image is copyright Dito Milian, GotBlueMilk.com. 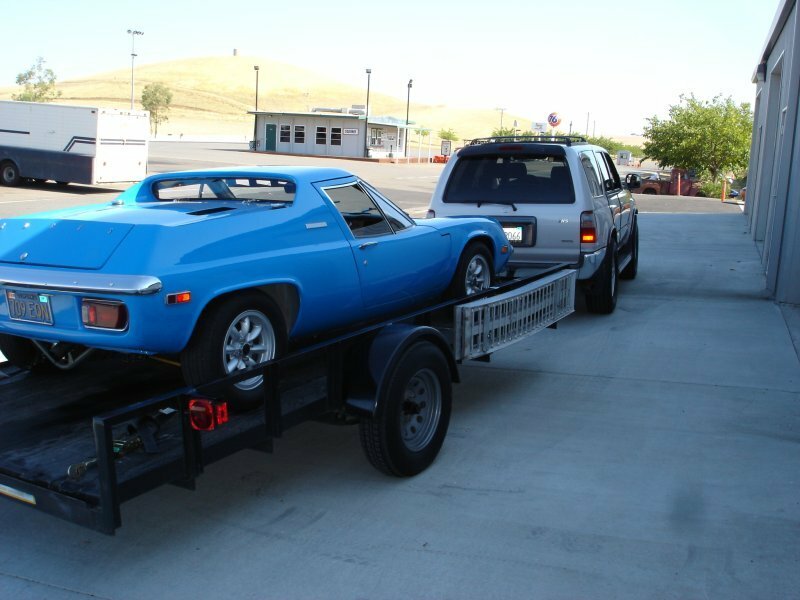 By this time I did have a trailer and was towing the car to track days, thus the trailer and 4Runner in the background. 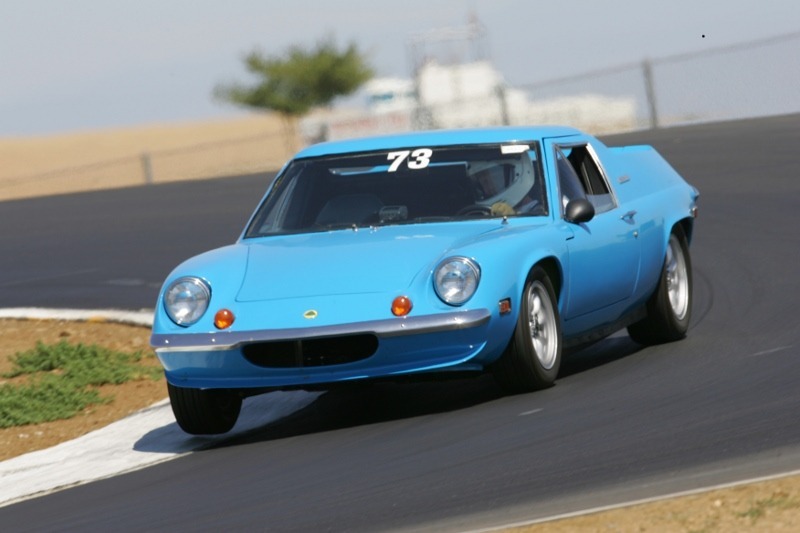 Dave Platt's very fast S4S and my Elan in the pits at Thunderhill, July 20k 2004. 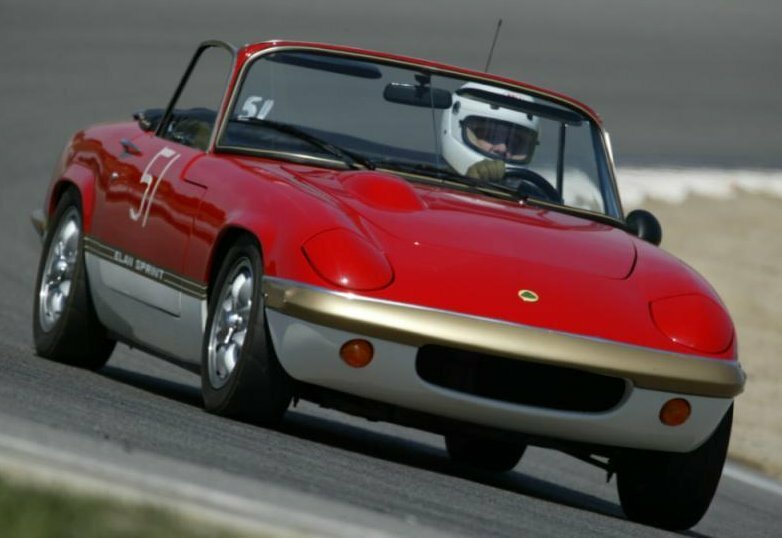 I purchased my Elan in Oct 2002, these 2003 pictures are copyright HeadOnPhotos.net and feature that Elan. 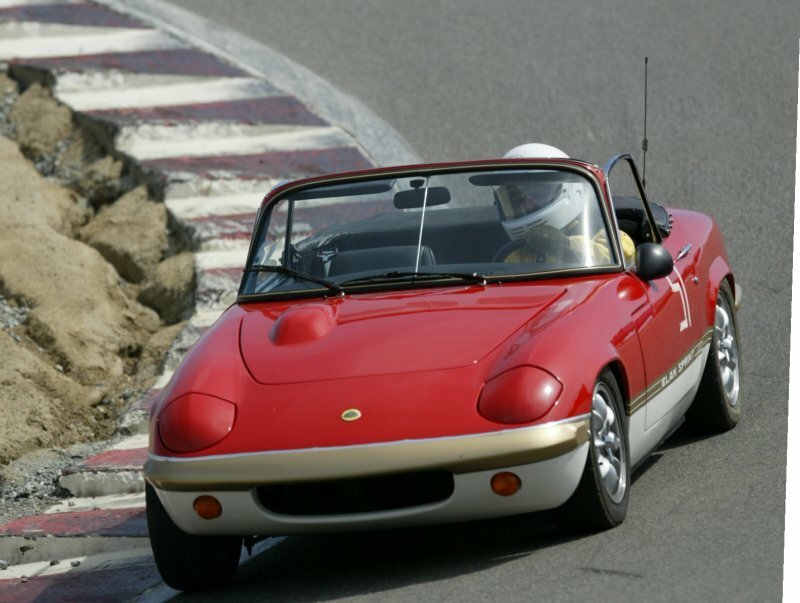 The 2003 track day schedule was April 9 Laguna Seca, June 25 Thunderhill, July 23 Thunderhill, Sep 4 Thunderhill, October 9 Buttonwillow. Also April 2003, exiting the famous Corkscrew. 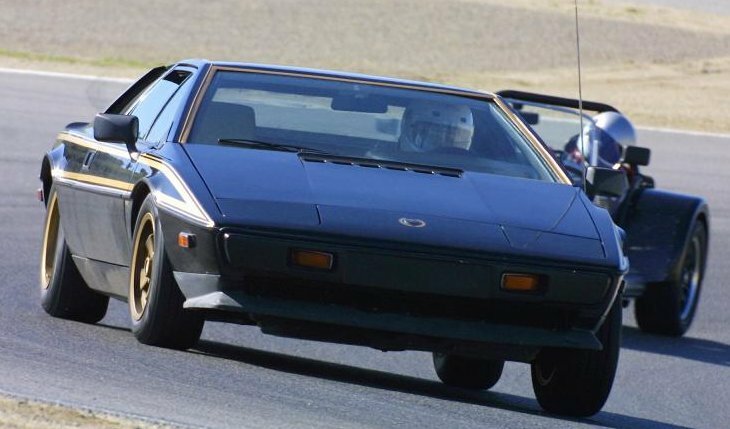 At Laguna Seca in 1979 Esprit S2, March 4,2002. Image copyright HeadOnPhotos.com. Coming out of the Laguna Seca Corkscrew in 1979 Esprit S2, March 4,2002. Image copyright HeadOnPhotos.com. May 2 was a Thunderhill Track day. The Esprit performed flawlessly as always. The tires are the right size, for the car (that is, front and rear are the correct different sizes), but very few tires are available in 14 inch in the right sizes so the car has street tires, not performance tires. Image copyright HeadOnPhotos.com.